The women are pressed into the work force not by nascent feminism but by inflation, which has spiked to 12.7 percent from 1.4 percent in the past seven years. As a result, one salary — the man’s salary — can no longer feed a family. At work, some women spend more time deflecting abuse from customers than serving them. On the way home, they are heckled in buses and condemned by neighbors. It is so common for brothers to confiscate their uniforms that McDonald’s provides women with three sets. She reluctantly agreed, but pleaded to be sent to a restaurant two hours away so she would not be spotted by family members and neighbors. After three years, her family still thinks she works in the basement of a call center. On several occasions, she served old friends who did not recognize her without a head scarf. Her confidence has soared, but she is overwhelmed with guilt. The women interviewed said they had to battle stereotypes that suggested that women who work were sexually promiscuous. Sometimes men misinterpret simple acts of customer service, like a smile. Fauzia, who works as a cashier at KFC, said that last year a customer was so taken with her smile that he followed her out the door and tried to force her into his car before she escaped. Sunila Yusuf, a saleswoman who wears pink traditional clothes at home but skintight jeans at the trendy clothing boutique in the Park Towers shopping mall, said her fiancé had offered to pay her a $100 monthly wage if she would stay at home. “He knows that Pakistani men don’t respect women,” she said. For Fauzia, the hardest part of the day is the 15-minute walk through the narrow alleys to reach her home. She wears a burqa to conceal her uniform, but word of mouth about her job has spread. Neighbors shout, “What kind of job is this?” as she briskly walks by with her head down. 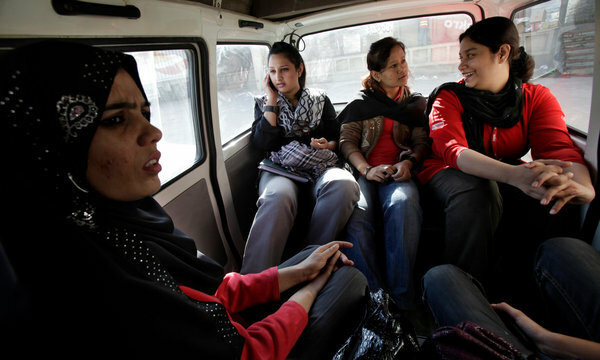 As a solution, some companies spend up to $8,000 a month to transport their female workers in minivans. A federal law, citing safety concerns, prohibits women from working after 10 p.m. It was extended from a 7 p.m. deadline last year. Most companies, however, are unwilling to absorb the extra cost of employing women. Even most stores that sell purses, dresses, perfumes and jewelry do not employ women. Kamil Aziz, who owns Espresso, the city’s most popular coffee chain, said he made it a point not to hire “the other gender” because women could not work the late shift and the turnover rate among women was higher. He said he also did not want to invest in separate changing rooms. Nearly all of the 100 women interviewed said marriage would end to their careers. But many of them saw benefits along with the hazards. Most women said that they had never left the house before taking a job. Many spent the first five months missing buses and getting lost. When they first arrived at work, they stuttered nervously in the presence of men. “I’ve learned never to take what husbands say at face value,” said Sana Raja Haroon, a saleswoman at Labels, a clothing boutique where men sometimes slide her their business card.